More direct international air routes are being connected with Busan City, the country's second largest city along the southeastern coast of the peninsula, with autumn tourist season going into high gear. Korean Air has announced its twice-a-week direct air service on Busan-Hanoi route starting Nov. 1 following the Philippine Airline's recent decision to increase frequencies of its direct air service linking Busan with Manila to six times a week in October. Air Paradise, Bali's international airline founded in 2002 to build tourism to Bali with a major focus on safety, service and competitive pricing, has recently opened its office in Busan and started flying directly to Bali from Oct. 2. Also jumping on what they described as "Busan bandwagon" is Cebu Pacific, the Philippines-based lowest cost, highest customer loyalty airline operator, which will fly charter plane linking Busan directly with Cebu, emerging honeymoon destination for Korean newly weds. Phuket Air, one of its B747-300 planes is being seized TV Club, a Korean general sales agent for the Thai carrier at Incheon International Airport because of debt owed to its local sales company, is considering flying regular charter flight between Busan and Bangkok in November. Taiwan carrier Transasia Airways has decided to increase its twice a week service to three times a week on Busan-Taipei route starting in November. In the meantime, more Chinese carriers are considering increasing or newly inaugurating flights to and from Busan. China Eastern Airlines plans to replace its plane running on Busan-Shanghai route with a wide-body plane of 340 passengers to meet the growing tourist traffic. Starting from Oct. 14, BIE will fly a direct charter flight service on Busan- Zhangjiajie under a lease contract with China Southern Airlines. To meet the growing seasonal demand for Korean golf tourists destined for popular golf courses in China in November and December, both Korean and Chinese air carriers are considering flying charter planes to other popular destinations including Haikou and Kunming linking directly with bustling southern port city of Busan with an approximately 3.7 million residents. Busan is the second largest city in Korea and the largest container handling port in the country and the third largest in the world, with potential for even more growth. 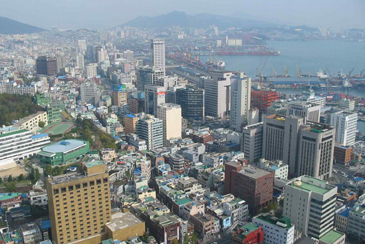 Its natural endowments and rich history have resulted in Busan's increasing reputation as a world-class city of tourism and culture.